ZOTE All-purpose pink laundry bar soap. Ideal for Catfish bait. Fishing recipe: cut a bar of Zote soap into 5 or 8 chunks, it also works well for cat fishing, then you also have hand cleaner. Works well. Tight Lines...Zote Soap. Zote�s citronella smell attracts the fish and it works better in warm waters. It�s ease to cut and stays well on the hook. Other names for Catfish are: Siluro, Silurus Glanis, Wels Catfish o Catfish angling. 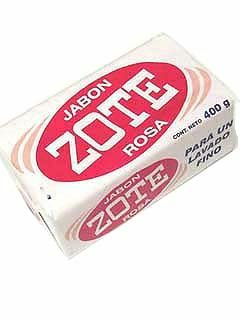 Jab�n Zote en barra para lavar rosa multiusos. Para un lavado fino Jabon ZOTE. Fabrica de Jabon La Corona. Zote sirve como carnada para pescar "cat fish". Otras formas de llamar el Pez Gato son: Siluro, Silurus Glanis, Wels Catfish o Catfish angling. You will not smell like catfish after you wash your lady area with this soap. It has a good clean smell and cover a lot of stuff up. Actually my grandfather always used this as bait, he said the catfish go crazy for it. You just put a small chunk on your hook and that's it. I've never caught a fish with it but I've never caught a fish with any bait. It's probably the color of it that attracts them. It's bright pink. I've used this a bunch of time making homemade laundry detergent and it works exceptionally well. It saves me money and it works very well for what I need it to do. I've never thought it could be used for catfish bait though, that might be a typo because I'm having a hard time believing that. Love this soap! I used it to make laundry detergent because Fels and Octagon make me wheeze. It works great and I love the smell. I cut off a piece to bathe with and found it to be very gentle. I make my own laundry soap and I like Zote better than other laundry bars for this purpose. 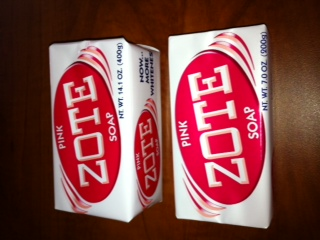 I tried this soap twice and believe me it really better and cheaper than most stain removers. It has a nice, clean scent too. one drawback: It is hard to cut pieces off the bar: I have find a cerrated knife or chisel, but I love it! It lasts longer than sprays because it is thick.